Developing and selling Precision Positioning Switches / Sensors and Tool Setters. TOYOTA MOTOR CORPORATION / HONDA MOTOR CO., LTD. / NISSAN MOTOR CO., LTD. / YAMAZAKI MAZAK CORPORATION / MORI SEIKI CO., LTD. / OKUMA CORPORATION / DENSO CORPORATION / MISUMI GROUP INC. / DOOSAN MECATEC / INTEL CORPORATION, etc. Those who cannot love colleagues and their own works cannot love products and customers! The first priority is put on ES (employee satisfaction), and Metrol is found in 1990, the time before morale of organizations and people became the social issue. Found Metrol Co., Ltd. in 3-5-2, Midori-cho, Musashino-city, Tokyo. Co-developed “MT-Pulser” with TOYOTA MOTOR CORPORATION and started supplying it for all TOYOTA car-manufacturing lines including overseas factories (TMS standard approval). Relocated the office to NEW TACHIKAWA AIRCRAFT CO., LTD Bldg. 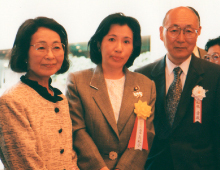 35 (Current Tachihi Real Estate). Developed the Tool setters for CNC lathes and started selling for machining tools industry. Launched business overseas via direct sales website “TOOLSENSOR.COM” for customers all over the world. 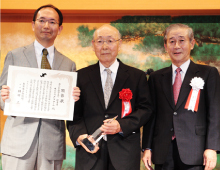 Increased capital by securing an investment from Tokyo Small and Medium Business Investment ＆ Consultation Co., Ltd. as a growth-oriented medium business. Found sales subsidiary “METROL (SHANGHAI) Trading Co., Ltd.” in Shanghai, China (100% ). Divided the headquarter functions; relocated the office to Bldg. 25 with the production department left in Bldg. 14. Minister of Economy, Trade and Industry, Yukio Edano visit Metrol to inspect our factory. The BCP business continuity plan was formulated. 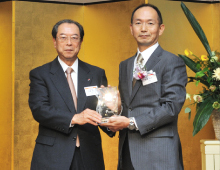 With the head director of Tama Shinkin Bank at the award ceremony of “The Tama Technology Award of Bank” in 2010.